Head to our Lou Malnati's Rewards FAQs for some common questions about our rewards program. Rest assured, our pizza boxes do not and have never contained any of these chemicals. We will continue to make our boxes (and pizzas!) the way we always have, and you can keep eating our delicious deep dish the way you always have! If you have additional questions regarding this topic, please contact us. No, we do not take reservations. However, if there is a wait, you can pre-order your pizza when you leave your name with the host. This will cut down the wait time for your pizza once you are seated. Our 53rd Chicagoland location opened in Rockford on February 11, 2019. Additionally, we have three locations in Arizona – a full-service restaurant in downtown Phoenix, a full-service restaurant in Scottsdale, and a carryout & delivery location in Arcadia. For a complete list, view all of our Locations. You can satisfy your deep dish cravings by having Lou's pizza and other Chicago favorite foods shipped to you though our Tastes of Chicago mail-order division. Please visit Tastes of Chicago's website for more information and to place your order. We are a family owned and operated business and we do not franchise. The quality and consistency of our food is critical to our success and we do not feel that we could control that to our standards by franchising. Lou Malnati's is a family-owned foodservice company in a unique environment and produced by a management team and staff committed to each other, the customer, and the community. Regarding products served, Lou Malnati's features its signature item, deep dish pizza and other quality homemade food made to order. Innovation of products and services is important, as is good food at reasonable prices. Lou Malnati's is a tradition, with customers and employees representing second and third generations of involvement with Lou's. We have three locations in Arizona – a full-service restaurant in downtown Phoenix, a full-service restaurant in Scottsdale, and a carryout & delivery location in Arcadia. 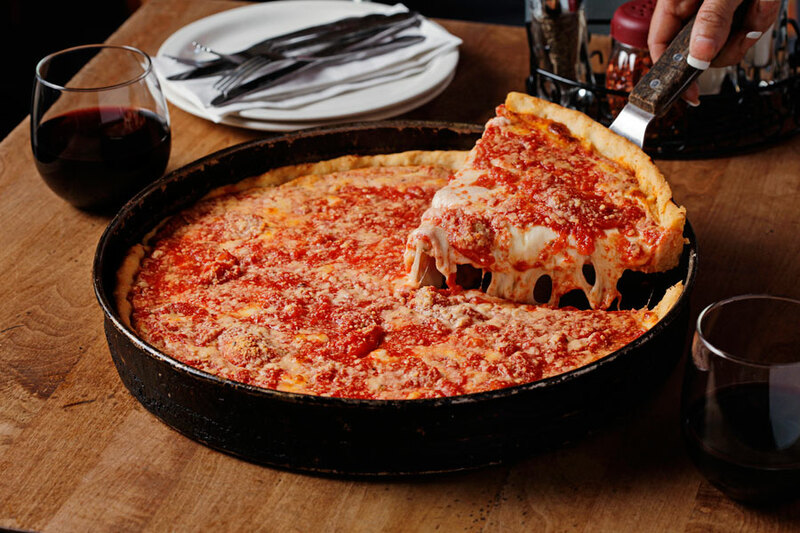 For our fans outside of Chicago or Arizona, you can satisfy your deep dish cravings by having Lou's pizza and other Chicago foods shipped to you through our Tastes of Chicago mail-order division. Please visit Tastes of Chicago's website for more information and to place your order. For a complete list of Lou Malnati's pizzerias, please visit our locations page. Lou Malnati's is owned and operated by the Malnati Family. Lou got his start in the 1940’s, working alongside his father in Chicago’s first pizzeria. Then Lou took his pizza expertise to the northern suburb of Lincolnwood, Illinois, where he and his wife Jean opened the first Lou Malnati's Pizzeria on March 17, 1971. Aficionados of deep-dish pizza lined the streets on opening day for just a taste. Lou became legendary for his high-spirited character, generosity and passion for sports. Lou Malnati's was established on March 17, 1971. Our first pizzeria, located in Lincolnwood, Illinois, is still in operation in the original building. For donation requests, please visit our Fundraising & Donations pages. With prior approval from Lou Malnati's Marketing Department, and accompanied by an appropriate Lou's Crew team member, we can arrange for you to film or photograph in our pizzerias. You can find allergy and nutritional information on most of our menu items by visiting our nutritional information page.